Have a question? Call to order! 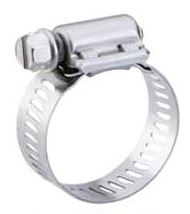 This perforated stainless steel worm-gear clamp (with stainless steel screw) has adjustable sizing and is designed for hard-wearing industrial applications. It's heavy duty four-piece Quadra-Lock construction enables far more tightening torque to be delivered to the band perforations.